All entry fees (other than EAL) will be allocated to the ISL School Growth Fund. The School Growth Fund is currently allocated to the Building repayments. The Stability reserve is to protect the sustainability of the school and to help alleviate future fee increases due to fluctuations in the government’s subsidy, enrolment and extraordinary economic circumstances. The Tuition fees are to fund the annual operational budget of the school. Please note that the school fees benefit from the Luxembourg State Subsidy for private schools which presently averages approximately €7,400 per child. Without this State subsidy the tuition fees payable would increase by a similar amount. Please click here to view a full lists of the additional schooling costs. Formal written notification of withdrawal, signed by the parents/guardians, addressed to the Business Office, must be received by registered mail, at least two months in advance of the actual date of departure or non-arrival. The notification may also be personally handed in to the Business Office to collect proof of official school receipt. Any month started is considered fully enrolled and attended. Any outstanding balance at the time of departure will result in the school records being withheld. For a sample notification letter, please click here. Entry fees, deposits, stability reserve and school growth fees will be considered fully owed and non-refundable. i.e. For all students registered, new or returning, not coming for the first day of School, the last notification date to avoid fee forfeits is 30th June each year. i.e. All students, not starting as planned will be liable to fees as soon as registered. In the event that the school has to close its premises, due to circumstances beyond its reasonable control, tuition fees and other fees shall not be reimbursed. Annual School fees are invoiced once the annual enrolment contract is submitted stating the effective due dates. For students joining during the course of the school year, invoices are issued before the enrolment date and payable prior to the student’s start date. School fees are considered owed per contractual agreement even if not yet invoiced. 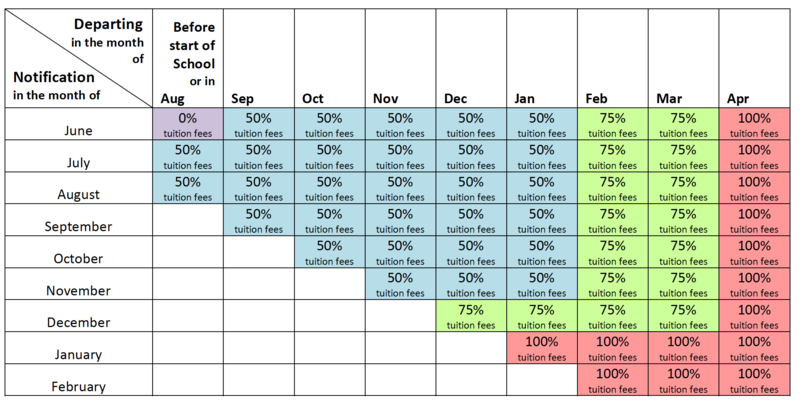 A minimum of 67% of the fees are to be paid no later than June 30th and the remainder by February 1st. Fees are considered fully owed by June 30th should no withdrawal notification be received. The school reserves the right to delay entry, withhold school records or charge interest on past-due accounts or launch a collection process for any overdue outstanding balance. Should invoicing be required in a company or third party name or payment be received from a source other than the parents or guardians, please click here for the Third party authorisation form. The enrolment of a student is an individual contract between the parents or guardians and the school regardless of any arrangement parents or guardians may have with their employer or any other third party concerning the payment of the school fees for their child(ren). For all late enrolment and registration, please carefully take note of the conditions applicable for Early withdrawal and registration cancellation applicable as Annual School fees will be owed immediately on signature of the enrolment contract.